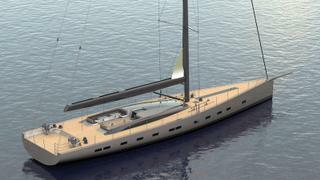 British yard Oyster Yachts has joined forces with the Reichel-Pugh design studio for its latest sailing yacht, the 33.53 metre Project Alpha. This carbon fibre sloop was developed for a repeat client who prefers to fly to his yacht rather than cruise long distances. This design has already attracted significant interest, leading the yard to consider investing in female moulding. Such an approach helped the yard to sell the second 118 yacht before the first hull had been completed, as the ability to build in tandem reduces lead times. Accommodation on board Project Alpha is for up to eight guests split across four en-suite staterooms, including a full-beam master suite in the bow. Meanwhile, the crew quarters allows for a staff of up to six people and a stern-loading garage provides the tender storage. Two coachroof designs have been created, with a wedge deck (top image) and a more traditional Oyster-style deck (pictured above). Despite this new partnership, Oyster is continuing to develop new models with Rob Humphreys Yacht Design, including a new 32 metre (pictured below). 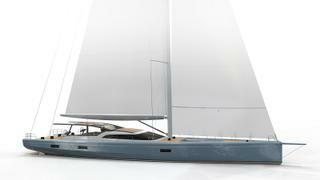 This sloop-rigged yacht is currently subject to a feasibility study for an existing Oyster owner as an alternative to the third Oyster 118, with the aim of launching in 2020. 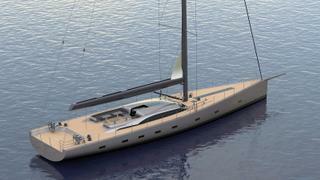 Key features include a removable bimini for regatta racing and a total displacement of 95 tonnes. Other superyacht projects under development at the British yard include the 27.12 metre Oyster 895, which replaces the outgoing Oyster 885.